The term igneous rock cycle is not really a term at all, but in terms of the rock cycle igneous rocks are the beginning place. All of the rocks on the surface of our planet were at one time molten rock. Beneath the thin rocky crust of the earth is the inferno of the mantle! This is the origin of igneous rocks. The mantle is the home of magma, the name of molten rock while it is still beneath the surface of the earth. Igneous rocks are formed from this molten magma. These rocks form when the magma cools and crystallizes. This can happen above ground as with lava. 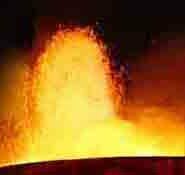 It can also form below the surface when the molten rock rises in the crust but does not reach the surface. When the magma reaches the surface it cools quickly, a matter of days or weeks. When the magma forms pockets underground it cools much more slowly. This could take thousands or even millions of years. The rate at which the magma cools determines the kind of igneous rocks that are formed. Faster cooling surface lava creates rock that is fine grained or aphanitic. The rapid cooling doesn’t allow large crystals to form. In addition most of the gasses are driven off into the atmosphere. The slower cooling that takes place underground allows larger crystal formation. 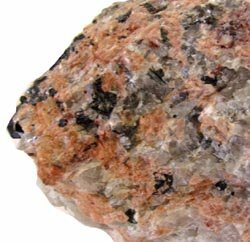 The Granite pictured above is an example of this type of rock formation.